But that the German chancellor Angela Merkel and the troika of Greece’s European and International Monetary Fund creditors are out to remove the elected government in Athens now seems beyond serious doubt. 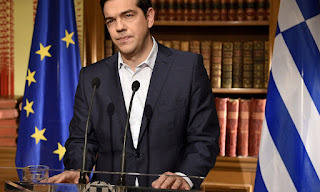 Everything they have done in recent weeks in relation to the leftist Syriza administraton, elected to turn the tide of austerity, appears designed to divide or discredit Alexis Tsipras’s government. They were at it again today, when Tsipras offered what looked like almost complete acceptance of the austerity package he had called a referendum on this Sunday. There could be no talks, Merkel responded, until the ballot had taken place. There’s no suggestion of genuine compromise. The aim is apparently to humiliate Tsipras and his government in preparation for its early replacement with a more pliable administration. We know from the IMF documents prepared for last week’s “final proposals” and reported in the Guardian that the creditors were fully aware they meant unsustainable levels of debt and self-defeating austerity for Greece until at least 2030, even on the most fancifully optimistic scenario.